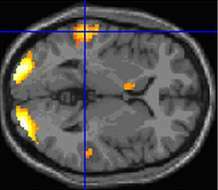 Scientists mapped brain activity when subjects read poetry and prose. (Medical Xpress)—New brain imaging technology is helping researchers to bridge the gap between art and science by mapping the different ways in which the brain responds to poetry and prose. Scientists at the University of Exeter used state-of-the-art functional magnetic resonance imaging (fMRI) technology, which allows them to visualise which parts of the brain are activated to process various activities. In research published in the Journal of Consciousness Studies, the team found activity in a "reading network" of brain areas which was activated in response to any written material. But they also found that more emotionally charged writing aroused several of the regions in the brain which respond to music. These areas, predominantly on the right side of the brain, had previously been shown as to give rise to the "shivers down the spine" caused by an emotional reaction to music. . When volunteers read one of their favourite passages of poetry, the team found that areas of the brain associated with memory were stimulated more strongly than 'reading areas', indicating that reading a favourite passage is a kind of recollection. In a specific comparison between poetry and prose, the team found evidence that poetry activates brain areas, such as the posterior cingulate cortex and medial temporal lobes, which have been linked to introspection. Professor Adam Zeman, a cognitive neurologist from the University of Exeter Medical School, worked with colleagues across Psychology and English to carry out the study on 13 volunteers, all faculty members and senior graduate students in English. Their brain activity was scanned and compared when reading literal prose such as an extract from a heating installation manual, evocative passages from novels, easy and difficult sonnets, as well as their favourite poetry. Professor Zeman said: "Some people say it is impossible to reconcile science and art, but new brain imaging technology means we are now seeing a growing body of evidence about how the brain responds to the experience of art. This was a preliminary study, but it is all part of work that is helping us to make psychological, biological, anatomical sense of art." All of the volunteers were students of English and they became excited when reading poetry. From the article "and compared when reading literal prose such as an extract from a heating installation manual"...if the subjects were engineering students, would the excitement have been in evidence during the reading of the poetry or the reading of the manual?